Heather Hoch Korea House uses bright spices and a balance of sweet and savory to achieve their flavor palette. Open: Monday – Saturday: 11 a.m.-9:30 p.m.; Sunday: 4:30 p.m.-9:30 p.m.
Pros: The pork kalbi will linger in your mind for days after you visit. Friendly, family atmosphere. Cons: Compared to other Korean spots in town, it seemed some of the dishes were toned down in terms of spice and flavor. Korean cuisine is kind of having a moment right now. Maybe it’s the slow, but steady acceptance of fermented foods in the American culinary consciousness—an integral flavor in the ban chan or side dishes that accompany main dishes in Korean cooking. Maybe it’s just an inevitable next step after accepting Chinese dishes and then sushi and then pho into mainstream American dining. Maybe it’s the effect of Korean celebuchefs like David Chang and Roy Choi. Probably it’s some perfect storm of all three, but that storm has only really been blowing for a short amount of time. That’s why when I tell you that Korea House, located off of Speedway Boulevard just east of Alvernon Way, has been owned and operated by the same family for 30 years, you should be both shocked and amazed to some extent. Most impressively, the menu serves up uncommon, but authentic dishes, not combining Korean food with sushi or Americanized Chinese fare—a relatively common practice for Korean restaurants in the past—to pander to crowds not ready to take the plunge into a world of spicy, smoky, sweet, tangy flavor. However, it should be said that when you walk into Korea House, you can definitely tell the spot has been around a while. The restaurant carries a certain level of dinginess in décor that might bother more persnickety diners. Personally, this sort of thing doesn’t bother me. Sure, the wallpaper—a scrolling pattern of Korean symbols— is browning in areas, and the carpet might not look the most well-kept, but for a long-standing fledgling family restaurant it seems to be holding up well and carrying a sort of vintage charm that outweighs its shabbiness. Plus, it’s clean where it counts— the tables, plates and cutlery. You have your choice to sit in the main dining area, a more private table in an enclosed room or on the floor at a chabudai-style table. The small, four-top private room tables provide an excellent and intimate experience for you and a few friends. After making your assessment of the décor, the second thing you’ll likely notice is that Korea House is, without a doubt, a family restaurant. That means you’ll get friendly, welcoming and attentive service, but it also might mean the owner’s kid could be walking around chatting loudly—just like if you were having dinner at a relative’s place. With age, the staff at Korea House has grown to put warnings on certain dishes when you order them. Take, for instance, the naeng myon ($9.95)—a soup that promises buckwheat noodles, beef, veggies and a soft-boiled egg served cold. “Are you sure?” the server asked. “Well, that’s a very authentic dish. People sometimes don’t like it because they don’t expect it to be cold. It’s very traditional,” she warned. Little did she know, that really only made me want the soup more. While the heaps of buckwheat noodles and lightly sweet and refreshingly cool broth weren’t sticking points at all, I’ll admit I was a little bummed out to find a hard-boiled egg atop my soup where I was promised a soft-boiled one. Still, for soup lovers, you should keep this dish on your radar as we stumble into the unrelenting summer heat. Starters at the restaurant feature rice cakes with sweet chili sauce (duk bok gi), crepe-like pancakes with shrimp and squid, fried dumplings, seaweed-wrapped rice and beef and a pan-fried bean cake studded with pork and kimchi (bean dae duk). The latter option ($5.95 for four cakes) is golden brown and crisp on the outside, though more pork and kimchi would’ve given the cake more flavor to match its solid preparation. When trying out a new-to-you Korean spot, a couple dishes are typically good barometers for what to expect. There’s bibimbap (spelled on the menu here bibeem bob) and bulgogi (spelled on the menu here bool gogi), which comes in beef, pork or chicken. 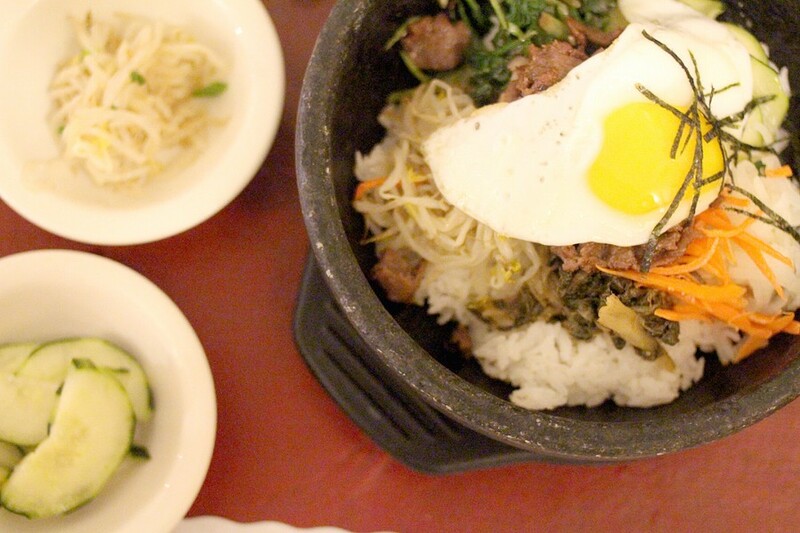 The bibimbap, a bed of rice topped with beef, black mushrooms, vegetables and an egg, can be ordered crackling and popping tableside in a hot stone bowl for $12.50 or in a regular bowl for $9.95. However, like the naeng myon, I was greeted with an egg cooked past how I typically like it. Here, it was placed on top already fried, while a raw egg in a hot stone bowl gives you the opportunity to cook your egg at the table as you clank your chopsticks around the bowl. Overall, the dish was on the bland side, though the accompanying gochujang chili sauce was a nice addition—which, if you’re unfamiliar, is kind of like Sriracha’s smoky Korean cousin. The beef bulgogi while lightly sweet and nicely spiced came with an inordinate amount of onions, though it’s easy enough to pick out the meaty bits, pile it on rice and add in some ban chan. Here the ban chan seems to be the same every time—kimchi, pickled bean sprouts, gamja jorim (or glazed potatoes) and sweet pickled cucumbers. If you’re looking for seafood, the squid and vegetables ($13.50) comes in a delicious bright red chili-flecked sauce, though the squid itself was a bit overcooked and rubbery. Perhaps the best dish at Korea House, though, is the pork kalbi ($17.50). The large, rustic rack of pork ribs is coated entirely in a chunky barbecue sauce that is everything you’d hope a barbecue sauce would be—an expert balance of sweet, spicy, smoky, salty and tangy flavors that will likely have you licking your fingers after picking the tender pork from the bone. For desert, red bean or green tea ice cream ($3) as well as fruit, sweetened condensed milk and red bean paste topped shaved ice ($5.95) offer flavorful ways to finish the meal. However, if you’re anything like me, you’ll probably save your money and opt for a large bottle of OB (Korean beer; $6.50) and a small bottle of soju (Korean rice liquor; $13) to split with a fried, pouring shots and taking sips between bites of spicy Korean eats. While others in town have stepped in to carry the Korean cuisine torch as well, such as KimchiTime with their flawless ban chan and Seoul Kitchen, it’s hard not to appreciate Korea House for hanging on as long as they have. 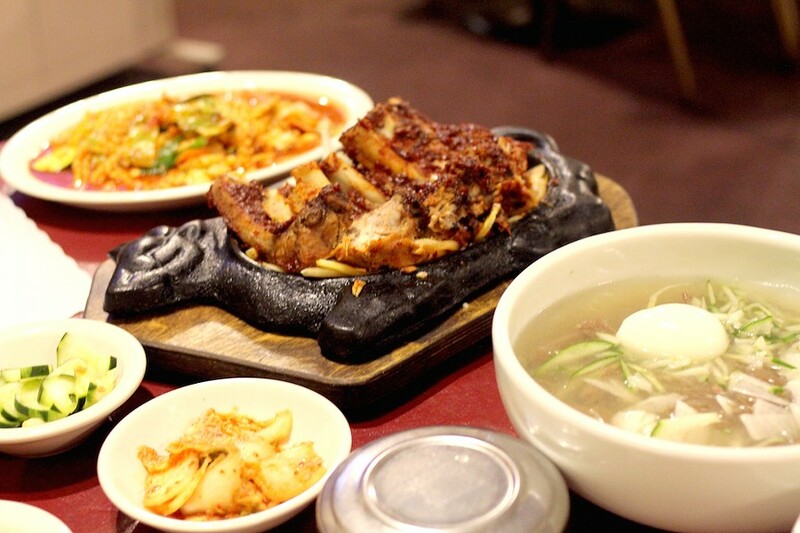 Korea House has its stand-outs that make it worth including in your restaurant rotation.